Football! FOOTBALL! Oh how I love this time of the year…for so many reasons. Cooler weather means more jeans and less skin (and no swimsuits in sight for months!). Crackling fires, crisp mornings, comfort food and … did I mention…FOOTBALL?! There’s nothing better than donning my ‘official’ team jersey, cracking open my favorite beer and sitting down to some game day fare. I enjoy chicken wings and nachos…but lets face it, eating them every Sunday for 16 weeks (more if my team makes it to the playoffs) would just be trouble! Some of my favorite healthier (while still being yummy and game-day worthy) meals include turkey burgers or chili, no-fry fish tacos, and chicken kabobs. This past Sunday was the first (in what will be many months of) rainy, chilly Sundays we’ve had since last winter, so Paul and I were craving something hearty and different. 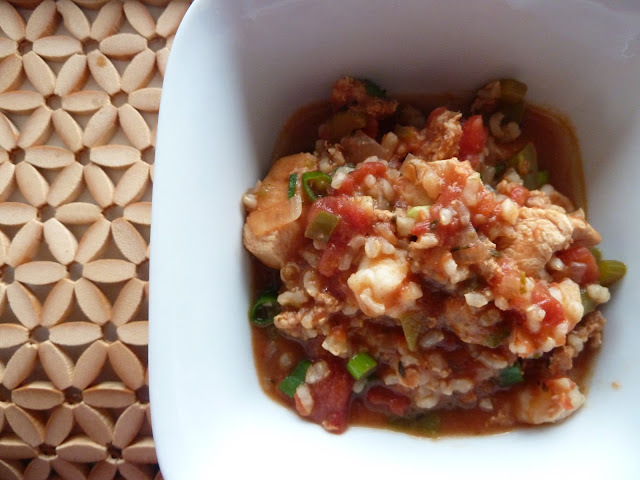 Enter…Jambalaya! In the true spirit of game day cooking, I decided to use a new toy I just received: the Ninja Serious Slow cooker (full disclosure–I am not being paid or incentivize for using/talking about this appliance…just wanted to share some cool features and tips). I rarely use a slow cooker, in fact, until I got the Ninja, I hadn’t owned one in years. One of the things I never liked about crock pot cookery was the need to saute and brown ingredients before adding everything to the slow cooker. The cool thing about this gadget is that you can sear, saute, and slow cook all in one pot! Amazing! The Ninja also has the ability to roast and steam bake (apparently you can use half the fat and still have moist cakes and brownies…LOVE that idea! :)). 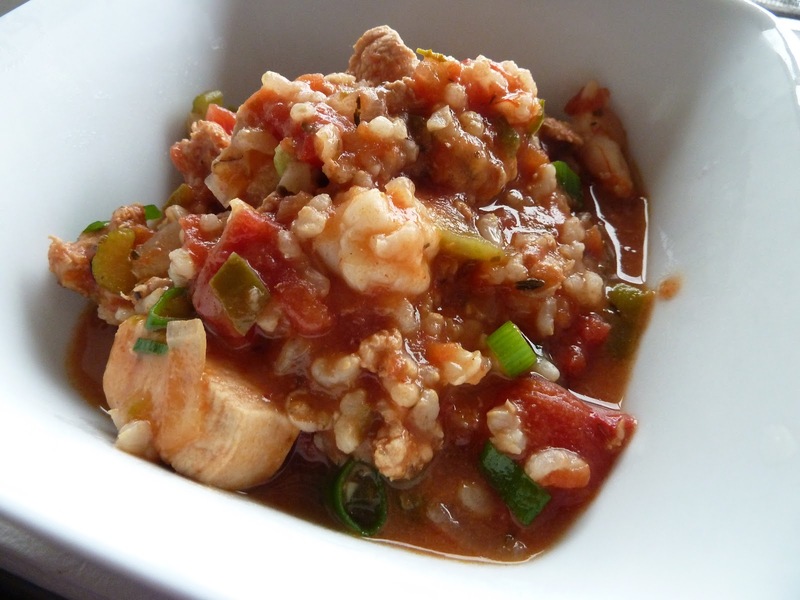 Anyhoo, I essentially tossed everything into the slow cooker and let it cook for a couple of hours and viola…delicious Jambalaya! (If you don’t have a slow cooker, no worries, you can easily prepare this recipe using a covered Dutch oven). Also worth noting, slow cooking tends to intensify the heat of spicy ingredients like Cayenne pepper, so be conservative with the amount you use and use a little more liquid as there will be more evaporation in the cooking process when cooked on the stove top (start with an additional 1/2 cup broth or water).